SecureGSM™ SP/Pro advanced feature set. Completely real-time full-duplex operation – works just like a regular cell phone. Excellent audio quality – comparable to standard mobile communication. Confirmation routines clearly identify sent, received and non-deliverable messages. Integrity verification routines ensure that the received message is the same as the sent message. At no time are you unsure of whether or not the other party has your message. Convenient way to transmit passwords, numbers or any other information which may be problematic to understand by voice. Where listening devices are suspected a whole conversation can be conducted using the messaging module. Simultaneous secure voice and secure messaging. SecureGSM™ SP and SecureGSM™ Pro feature robust, 256 bit, triple cipher, layered encryption based on AES, Twofish and Serpent ciphers. Any one of these encryption algorithms is considered unbreakable by today’s standards and the triple layer ensures that encrypted data is future proof. If any one of the encryption algorithms is broken, or found flawed in the future, it is not possible to obtain data to decrypt or compromise the remaining layers or chains. Robust asymmetric key generation engine, which is hardware optimised for fast key generation. Private and public keys are generated per session and subsequently destroyed (unrecoverable) upon termination of link. Calling party identity verification procedures as protection form “man in the middle” attack and comprehensive procedures to ensure keys or foreign data have not been injected or substituted by a third party. A 4Kbit public key ensures encrypted data is safe and secure. Truly international, language independent Party Authentication Module to protect against a Man in the Middle attack. Graphic style interface to help ensure, together with voice authentication, you are in fact connected to your intended party. Visual secure Digest function representation: SHA-256 algorithm. The Program Status Indicator specifically monitors the operating system for the presence and status of the SecureGSM™ SP program process and displays the current status accordingly on the Home screen and other key areas. 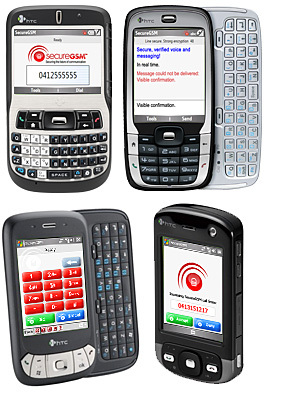 SecureGSM™ SP operates on compatible handsets. Please check the compatible phone list to see all available options for your chosen handset. 9600bps or better (Note: These services may not be available via all operators, and may require separate subscription. It is the customer's responsibility to ensure that CSD services are available with their preferred GSM operator). This product is designed to operate on a newer version of Windows Mobile. If need Evaluation version, please send email to info@onetech.com.tw or sales@onetech.com.tw. 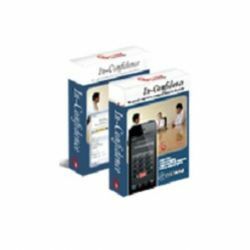 In-Confidence for iPhone and iPad is SecureGSM's next generation product designed to deliver our famous triple-layer encryption to Internet Telephony (Voice over IP - VoIP) communications. In-Confidence boasts an unparalleled level of security combined with state-of-the art, echo-free audio quality using superior quality audio engine components. But what sets In-Confidence apart from the competition is that it is the only dedicated multi-party conferencing product with triple layer encryption capabilities. These unique features combine to make In-Confidence the most user-friendly encrypted telephony application with a no-compromise security model.